The HinesLab subway-tunnel advertising provides bright video content that can be changed remotely. Unlike conventional signage that uses back-lighted posters viewed through slits, the HinesLab subway signage uses vertical LED light strips that are viewed through a liquid-crystal video screen. Horizontal motion of the train causes the images to be streak scanned. Persistence of vision causes the image to appear to follow the train just outside the window. 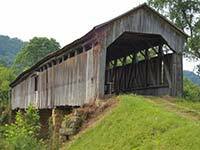 An analogy would be driving through an old wooden covered bridge with sides made of vertical boards. The landscape can be seen through the gaps between the boards which streak past too fast to be noticed. The distant scene is being streak scanned. A problem with previous sign technology was the low light level of back-lighted posters. The brightness was reduced an additional 98% when viewed through narrow slits. When the ad period ended, a maintenance worker had to go in the tunnel at night after the trains stopped for the day to replace the posters and flickering fluorescent lamps. The printed posters cost approximately the same as the LCD screens in the HinesLab approach. The LCD screens in the HinesLab approach need to be installed once, and can display live video. The HinesLab signage avoids these problems. Train riders view linear back lights through the transparent liquid-crystal display (an LCD TV screen without the diffuser). Each light box has several sub-images with a vertical light strip behind each sub image. Compare the relative brightness of (1) a back-lighted image printed on a white diffuser shown below-left, to (2) viewing the bare filament of a light bulb, or LED, through a 35mm Kodachrome slide or a clear LCD screen. Current tunnel signage uses printed posters back lighted with fluorescent lamps. The images seen by the train riders will be only 2% of this brightness because the posters will be viewed through narrow slits which are required for the scanning effect. The final image using this technique is very dim, and must compete with the ambient lighting in the train car. In the HinesLab signage, vertical LED light strips (simulated here with the filament in a clear-glass light bulb) are visible through a liquid-crystal display. Forward motion of the train causes horizontal motion parallax of the vertical light strip behind the screen to scan the image. Perceptual image lag leaves a streak-scanned image in the viewer’s mind so that the sign appears to hang just outside the train window. LED’s produce much less heat and have much longer life than fluorescent lamps, and best of all, the image can be changed at a computer at any time without going into the tunnel.